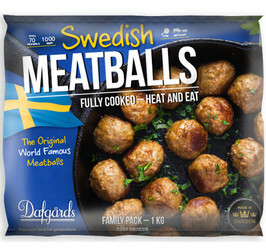 Classic Swedish Meatball. Retail packed. Beef and pork (80 %), water, onion, EGG, breadcrumbs (WHEAT flour, salt), potato flour, salt, potato fibre, spices.